Actress Aishwarya Rai Bachchan and her five-year-old daughter Aaradhya were spotted at the Mumbai airport on Thursday evening. The mother-daughter duo have flown to Melbourne, where Aishwarya will attend the Indian Film Festival of Melbourne (IFFM) 2017. Actor Abhishek Bachchan, Aishwarya's husband, came to the airport to drop them. Aishwarya and Abhishek were pictured sharing a warm hug before she made her way inside the airport. Aishwarya, 43, and Abhishek, 41, have been married since 2007. Aaradhya was born five years later in 2012. Aishwarya opted for an all-black look while Aaradhya looked cute in a pink top and blue denim. 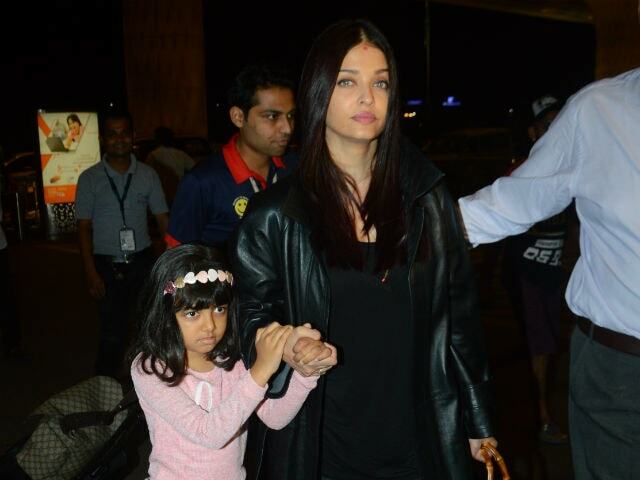 Here are the pictures of Aishwarya and Aaradhya at the airport. Abhishek preferred to stay in the car. Aishwarya will attend the opening weekend of IFFM. The 13-day event began on Thursday. The Sarbjit actress will also hoist the Indian flag at the Federation Square building on August 12 to mark the 70th Independence Day celebrations. The official Twitter handle of IFFM revealed details about the event. Konkona Sen Sharma, who debuted as a director this year with A Death In The Gunj, attended Thursday's event. A Death In The Gunj and her last release Lipstick Under My Burkha were premiered at the event. Celebrities like Karan Johar, Malaika Arora, Sushant Singh Rajput, Rahul Bose, Rajkummar Rao, Dangal director Nitesh Tiwari are also attending the IFFM. Meanwhile, Aishwarya, last seen in Sarbjit, is expected to soon begin filming Fanney Khan, co-starring Anil Kapoor. Last May, Aishwarya attended Cannes Film Festival. Aaradhya also accompanied her mother and a special appearance on the red carpet.